The Photographic World of Drew Gardner: At last! a new Mac Pro. Will I be buying one? There seems to be a little something in the air right now. Rightly or wrongly, there seems to be a narrative forming, from some sections of the media and analysts that the game is up for Apple. WWDC 2013 is a case in point. Judging by the comments of some media commentators and analysts you halfway expect Apple to put a big closed sign on the door and see a line of bailiffs at Cupertino waiting to repossess the fixtures and fittings of this 'failing' company. What Apple did show, some months ahead of launch was the new Mac Pro. I was very interested in this, as I, like many others in the photo and video world have been holding off replacing their existing Mac Pro's for many years. This very clever and innovative design, clusters processors together in a way which is super efficient at dissipating heat without the need for multiple fans. It's cylindrical shape is a massive departure from the familiar form factor of the tower which Apple has utilised for many years in all of its top end machines. Some say it looks like a pedal bin, perhaps in the photos it does but I reckon 'in the flesh' it will look quite cool. Its computing power is truly blazing, making editing and rendering a much quicker task. Will I end up getting one? Probably. But I do have my concerns. I have a Mac Pro 2,1 3ghz 8 core machine of 2007 vintage. It should be completely outdated, but it still more than holds its own, performing most tasks with ease. What has allowed this is the expandability of the machine, allowing me to update the machine with the latest HDD or SSD drives and updated graphics card. It would seem from what I have read that the graphics card is soldered imposition, so no chance of upgrading. My current Mac Pro tower IS very big, but it does have 4 bays to put in the drives of your choice, from the sounds of it Apple are relying on users adopting Thunderbolt external drives. All well and good but between Apple and Intel, there has been a drought of Thunderbolt accessories, with mutterings of a convoluted and expensive licensing process for third party companies. Mac Pro aside this is a situation that should not be allowed to continue. In my view the achilles heel of this cutting edge machine is expandability, and the barrier to updating and upgrading as you go. Yes, yes, I expect some of you to come out with many reasons why I should not. If the new Mac Pro can transform my studio workflow and processing as dramatically as my new Macbook Pro has it will be a no brainer. I worked on a brutal but fun shoot yesterday -18 hours of varied shooting. I was able to raw process hundreds of images in Capture One 7 (which improves with every release) and post them online for the client without any trouble whatsoever. In fact as good as my current Mac Pro is, the hard truth is my new laptop is much quicker. I do also hang on to a hope. With its less complex housing, without multiple fans, Apple may be able to offer this blazing new machine at a more affordable price. 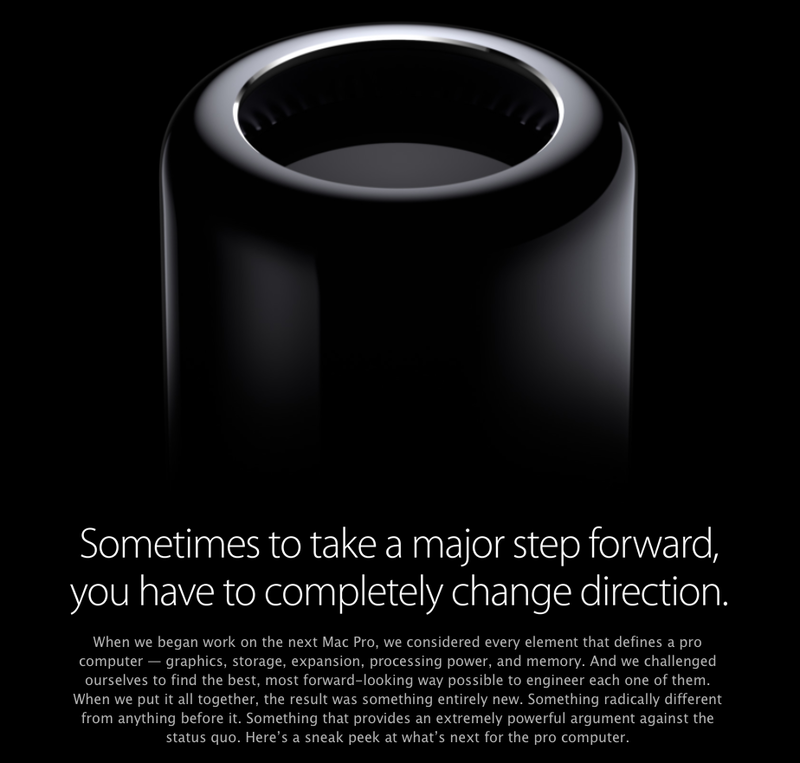 I expect the Mac Pro to play a very small but significant part in this. If they can indeed come up with a new intelligent design with enhanced performance, more power to them. On being non-expandable, that's unfortunately the wave of the future I think. Hey I think your workshop is this weekend? Much success and I hope you have a great time! Post a short video clip if you get the chance. I'm in the same exact boat although my Mac Pro goes back to 2006. Since mine is full of 4 drives as well. Not sure I want the headache of changing out the drives. Gonna wait and see what transpires. But I do anticipate the blazing speed too much to resist.